One of the main goals of the Segou Village Connection project, a Rising Voices grantee in rural Mali, is to train youth and villagers to join a team of local correspondents and send updates on local life and news via SMS or a second-hand laptop, to feed the project blog [fr]. How do you connect to the web in rural villages when there is often no cybercafe, no electricity, or computer? 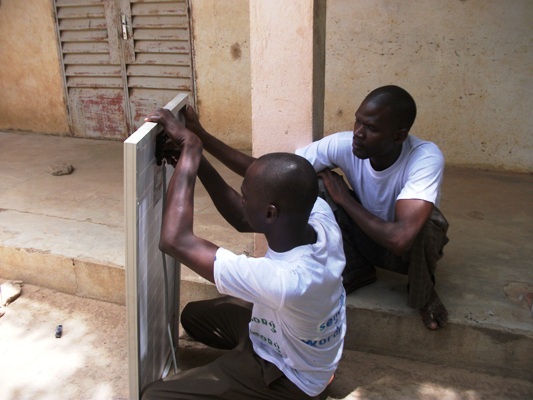 Segou Village Connection has opted for a grassroots solution. Thanks to the Rising Voices grant, a few pieces of equipments were bought by project leader Boukary Konaté and a mobile Internet unit set up. In this interview, he describes how he has been working towards the goal of amplifying voices from the rural villages despite these infrastructure challenges. Rising Voices: Hello Boukary, what do you need to be connected to the Web in rural Mali? 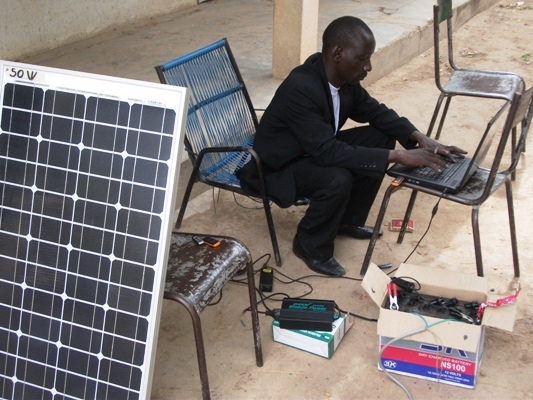 Boukary Konaté: Our mobile internet unit is composed of a second-hand laptop and a smartphone, a solar panel to power them with electricity, a battery to store electrical power, and a converter to have the correct voltage needed for the laptop and smartphone. We also bought a connection drive (shaped like a USB drive) to connect to the local GSM mobile network. It can be credited with minutes every month or when you need them. RV: Are you satisfied with this mobile outfit, now that you have tested it during training sessions in a few villages? BK: Definitely! As long as the sun is shining, you will have no problem. When the sun is shining, the battery is charged to the hilt and you can spend several hours on end surfing the Internet. RV: Have you encountered problems occasionally? BK: The only problem is the speed of the Internet connection via the mobile phone network. In villages where a 3G network is available, it works fine. In more isolated villages in Mali, you can connect only via the EDGE network and the signal is really weak. The other problem is the price of those equipments: thanks to the Rising Voices grant, we were able to spend more than 300 euros but it is way above the means of a village. RV: Does it require special technical knowledge to rig the solar cell to the battery and laptop? BK: Not really. You don't need a lot of time or many people to install the solar cell. Any person with basic knowledge of electricity or cars or motobikes, something manual, can connect the different devices. You must check carefully before buying a solar panel that its capacity is adapted to charge a laptop battery to the full. RV: Is it heavy? Can you travel from village to village with this system on a bike or a motorbike? BK: No, unfortunately no, you need a car. The solar cell is not heavy, but it is too big to attach it to a bike and risk breaking it. In between training sessions, this mobile outfit is stored in Cinzana-Gare, easily accessible from Bamako, via the tar-road to Ivory Coast. Local villagers have seized this opportunity to experiment with it. This summer, a local farmer, Mr Mobodo Traoré, has become really keen on the Internet. On August 29, he has sent to the capital Bamako, via Internet, his monitoring sheet of rainfalls through summer, a topic of burning interest to Malians, because next winter's food autonomy and food prices depend on it. Interesting project indeed! Following the blog feels like having a relative in Mali telling me stories of their lives. All the best with InfosSegou and congratulations to Mr. Konate! !